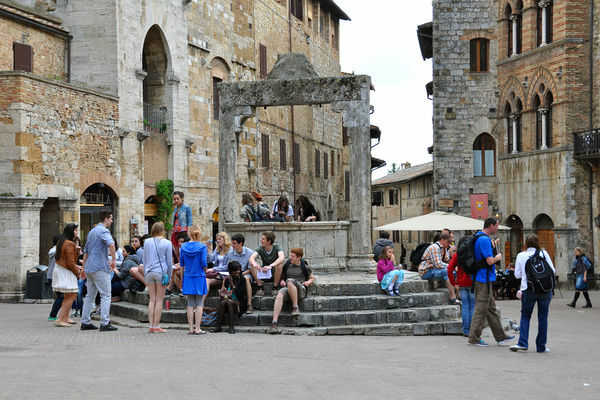 San Gimignano is the epitome of a Tuscan hill town. About 25 miles from both Florence and Siena, it's the region's glamour girl: Visually striking and perfectly preserved, it gets all the fawning attention from passing tour buses. But despite its tourist-trap feel, it's still worth slotting into your Italian itinerary — especially if you can sidestep the hordes who descend during the day. San Gimignano is beloved because of its skyline of medieval towers. Though a unique sight today, pointy skylines were the norm in Tuscany in the Middle Ages, when feuding noble families ran the hill towns (think Montagues and Capulets). Each family had its own private army that would periodically battle things out from the protection of its respective family towers. While some were built as a refuge against attackers, others were empty, chimney-like structures built only to boost noble egos. 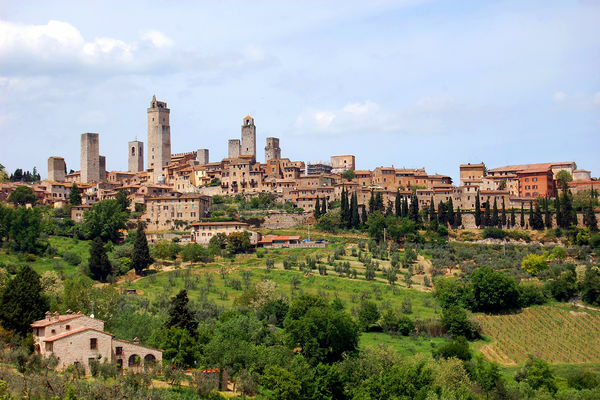 In the 14th century, San Gimignano, like other hill towns, fell under Florence's control. The Florentines usually asserted their power over the local nobles by ordering them to lop off their towers. But for whatever reason, some of San Gimignano's original skyline was allowed to remain intact. Today, 14 of its original 72 towers still stand. A stroll through the core of San Gimignano, in the shadows of its surviving towers, is a delight. 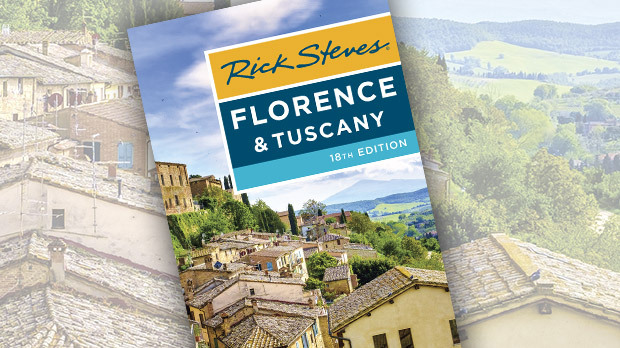 As the town was about a day's trek to Siena or Florence in the Middle Ages, it was a good stopover for pilgrims en route from those cities to Rome. Near the main gate, you can still see the remains of a 12th-century pilgrims' shelter. At the center of town is Piazza della Cisterna, named for the cistern that is served by the old well standing in the center of this square. Rustic-yet-proud facades crowd in a tight huddle around the well. I like imagining this square in pilgrimage times, lined by inns and taverns for the town's guests, with maids and children fetching water from the well. On Piazza del Duomo stands the town's Romanesque cathedral. Sienese Gothic art from the 14th century lines the nave with parallel themes — Old Testament on the left and New Testament on the right. This is a classic use of art to teach. Many scenes are portrayed with a 14th-century "slice of life" setting to help townspeople relate to Jesus. Of the 14 towers, visitors are allowed to climb the one at the newer City Hall — at 200 feet, the city's tallest tower. A visit here also includes access to a small museum with festive frescoes that provide a peek at how people dressed, lived, worked, and warred in the 14th century. Although San Gimignano is gorgeous, it is also quite crowded, and at midday it can come off as a pretty greedy place, with vendors everywhere vying for the tourist dollar. I find the charm of San Gimignano is easiest to enjoy after hours, when most tourists have gone back to their buses, vendors have made their money, and the town recaptures its magic. Smart travelers arrive here late in the day and stay overnight. Though San Gimignano has perfectly good accommodations, if you want to get the full dose of that salt-of-the-earth Tuscan magic, stay in the countryside surrounding the town, either at a bed-and-breakfast-type guesthouse or an agriturismo (a small, working farm that rents out rooms). At many of these places, visitors can enjoy fine food, a swimming pool, a serene setting, and the company of other travelers — and good Tuscan living. No matter where you stay, eating dinner at one of San Gimignano's restaurants provides a fine opportunity to sample typical Tuscan home cooking. Cinghiale (wild boar) is made into stews, soups, and — my favorite — salami. The area is well-known for producing some of the best saffron in Italy; you'll find the spice for sale in shops and as a flavoring in meals at finer restaurants. Although Tuscany is normally a red-wine region, the most famous Tuscan white wine comes from here: the inexpensive, light, and fruity Vernaccia di San Gimignano. After dinner, the empty streets are yours to savor. Enjoying San Gimignano at night gives you a chance to experience the romantic Tuscan town you've been dreaming about.